As experts predict that the number of coyotes wandering into Canadian cities and towns will continue to rise, we need to have ethical and safe methods of response prepared Coexistence with coyotes should be anticipated and mindfully managed. Coyotes are wary creatures who generally only attack when provoked. They don't tend to seek out humans, and are not nuisances outside of conflict. 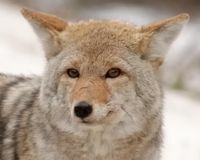 With proper instruction, the general population could stay calm in the presence of a coyote and make arrangements to accomodate them if necessary. Coyotes' habitats have shrunk due to urban planning, which makes their more frequent appearances in cities unsurprising. We can't predict when a coyote may be searching for new territory or drawn to trash left by the street, but we can prepare. We only have to consider coyotes a threat if we let them become one. Ask Canadian municipal authorities to draft management strategies for handling coyotes in urban spaces. Wild animals in urban settings is a present day reality and a future concern. Coyote populations in Canadian cities and towns have risen, and experts expect them to continue. For the safety and concern of both humans and coyotes, it is vital that you strategize the best ways to manage carnivorous animals coexisting with citizens in urban settings. I urge you to consult with ecology researchers and draft plans for managing coyotes in the future. There are errors in your form. Please fix the fields in red. Please take action on these important issues below. , this petition is now closed. You signed on . Please take action on these important issues below. , You signed on . we signed "Canada: Make A Plan to Coexist with Coyotes"
If everything looks correct, click sign now. Your signature will not be added until you click the button below.